When we first got custody of my husband’s son, it was about two weeks before his birthday, and this being my first child, I wanted to throw him a party he would love. Although the party went off without a hitch, it was definitely a learning experience! Here are eight steps to help make throwing a birthday party less stressful and fun for both your child and you. While this isn’t a requirement, it can definitely make the party more fun and seem ‘put together’. Ever since I have known him, Daniel’s favorite cartoon and movie has been the Transformers so naturally this is the theme he choose. A quick trip to the local party store, and for around $20 we had Transformer plates, napkins and a tablecloth. We were even able to find Transformer themed party favor bags which we filled with candy and small toys. If you cannot find party favors that go with your theme, you can always make your own by ordering some birthday labels and applying them to your invitations, the decorations, and even candy and small toys such as yo-yo’s and hand-held games for party favors. And if your child doesn’t have a favorite character yet, pick their favorite color, song or animal. Still no ideas? Try a book or nursery rhyme they love. Whatever you do choose, be sure to have fun with it! While many parents choose to hold their child’s birthday party at the house, there are plenty of kid-friendly alternatives. If you don’t want to spend a lot of money, consider having the party at your local park or a state park if there is one close. Places like this rarely charge a lot, if anything at all, for a party. If your child has a favorite restaurant like a local pizzeria, plan the party around lunch and set it up there. I used to work at a Mom and Pop pizzeria that had a small game room and children’s parties were held there all the time. Parents would let us know ahead of time so we could reserve enough tables. They would come in about an hour before the party and decorate the table with confetti and balloons. Most restaurants will even cut you a deal on food and drinks when ordering for a party. 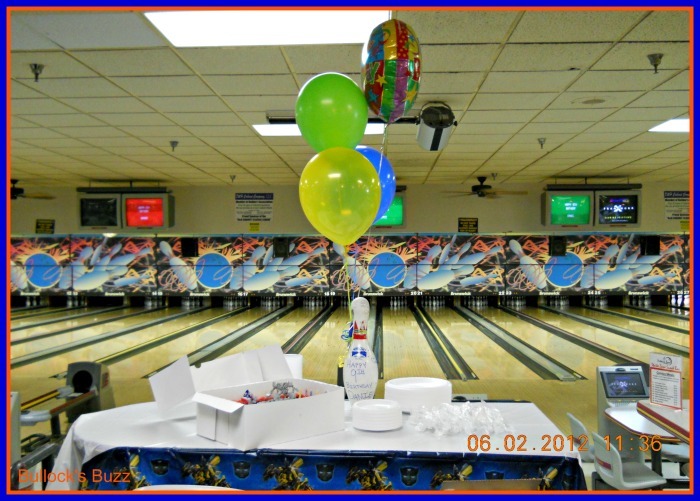 There is also your local skating rink, Go Kart track, community pool and bowling alley like we chose for Daniel’s party. This sort of goes hand in hand with the theme. 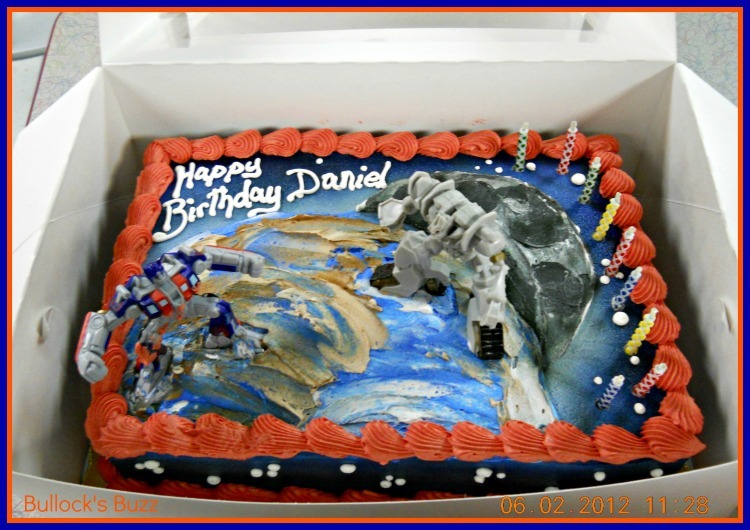 For Daniel’s Transformer-themed bowling party, a Transformer tablecloth with matching plates and napkins was placed on a table. A bowling pin for the kids to sign with several balloons tied to it was served as both a table decoration and a special memory. You don’t have to spend a fortune on decorations. Balloons, streamers and confetti can work wonders. Plus, you can easily make your own decorations from stuff you most likely already have at home such as these DIY Cupcake Liner Party Lights. Make sure you have plenty of finger foods and drinks for everyone there, especially if the party is in the afternoon or early evening. Children get hungry and eating only cake is not a good idea with a bunch of active children. You don’t have to serve a meal, just place some bowls of pretzels and fruit out, or order a pizza. Plus, if you have your party planned out into different activities such as skating, then lunch, the more skating, then cake and present time, it makes the party go much smoother. After all, every parent knows the importance of keeping kids occupied and on a schedule! If you are throwing the party in your home, plan one or two fun games, then serve some pizza, let the kids have “free play”, then do cake and presents. Don’t know any kid-friendly games to play? Search the internet – you will be surprised at how many creative activity ideas there are! Since we had just gotten Daniel, I didn’t have much time to throw this party together, but thankfully it worked out fine. However, planning ahead, at least by two months would have made things a lot easier and less hectic. This is especially important if you are passing out invitations to friends and classmates. It will also keep you from running all over the place at the last-minute to ensure you have everything you need, and if you ordered a cake, you will have plenty of time to make sure it is made correctly and ready on time. Get your spouse, family and friends involved in helping, especially if it is going to be a large party. This takes even more stress off of you, plus having other people to brainstorm ideas with makes for a great party! Having extra hands to supervise during the party is also a blessing. Plus, you can assign one person to take photos and that way you can be in the pictures celebrating with your child, too! And when it is time to clean up, you will be so happy to have that extra help! Even if you plan on filming a video, always take photos too. Like I mentioned above, this is where that extra pair of hands once again come in handy as you can be in the pictures with your child too. Plus, think of the special memory book you could make for your child to look at when they are all grown up! You could even make a web page documenting the party, then allow access to only the people you choose including friends, family and everyone who was at the party. Another fun idea, depending on the children’s age of course, is to have a few disposable cameras lying around and letting the kids take pictures of the party from their point of view! A birthday party wouldn’t be complete without party favors to hand out at the end of the party. Again, you don’t have to spend tons of money on these. Go to your local dollar store and buy some small, colorful bags, some candy and some of those little toys that work great as party favors. Party stores also often have giant bags already filled with favors that you can easily separate into smaller bags. Last, and most important, have fun yourself! Don’t let the stress of planning the party get you down on the big day. Follow these tips, and set everything up in its place, then go party with the kids and celebrate your child’s special day! Great tips! We’re doing my twins’ 2nd birthday party, soon. This helps!